Fortune magazine called it "the most successful product ever marketed in America"
As a symbol of the office, copiers have been immortalized in movies and on "SNL"
(CNN) -- It may be the most iconic piece of office equipment of the past half-century. It has saved workers countless hours, spit out forests worth of documents, been cursed by anyone who's faced a paper jam on deadline and been used by office pranksters to copy body parts. It's been immortalized in pop culture by Rob Schneider's "Saturday Night Live" skits -- "Ran-dyyy! The Rand-man! Randatollah! Making copies!" -- and by the secretaries of "Mad Men," who greet the 1962 arrival of the exotic new machine like a curiosity from another planet. It's that aging plow horse of the workplace -- the much-used, much-maligned office copier, and it's 50 years old. In March of 1960, the first plain-paper office copier was shipped to a paying customer by Haloid Xerox, a little-known photographic-supply company in Rochester, New York. The contraption was the size of two washing machines, weighed 648 pounds and had to be turned on its side to fit through doorways. It also occasionally caught on fire. But it revolutionized the workplace as we know it. "It's hard to imagine now, because we take it so much for granted. But it took human communication forward a huge step," said David Owen, author of "Copies in Seconds: Chester Carlson and the Birth of the Xerox Machine." "It was a product no one knew they needed until they had it." It was also a product that many loved to hate. The earliest models were so unreliable that Haloid Xerox's repair crews got emergency calls almost daily. In the cult hit movie "Office Space," three oppressed cubicle drones take a balky machine -- some say it's not a copier but a fax machine or a printer -- into a field and smash it to pieces. In today's digital age, a machine that copies paper feels like a quaint mechanical relic. And in most offices, the traditional copier has been eclipsed by the Internet-connected, multipurpose printer. But in its heyday, the copier was an indispensable tool that turned Xerox into a verb (much in the way "Google" is used today). Imagine workplace life in the 1980s or 1990s without break-room memos, NCAA basketball tournament brackets or copies of copies of dog-eared cartoons, pinned to cubicle walls or passed virally around the office. Remarkably, the first Xerox copier's core technology -- a process called xerography -- is still widely used in copy machines five decades later. It's a technology that, despite inspiring what Fortune magazine later called "the most successful product ever marketed in America," almost never saw the fluorescent light of day. Since the dawn of the written word, people have sought an easy, quick way to copy documents. The earliest "copiers" were actually monks who painstakingly transcribed text by hand with pen and ink. They were eventually replaced by printing presses, stencils and carbon copies -- those messy colored sheets of paper that were used for credit-card transactions. 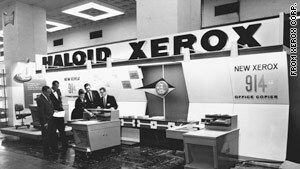 Haloid Xerox's booth at a 1960 trade show in Washington, D.C., where one of its three copiers caught on fire. The first primitive office copiers, introduced in the 1950s with such retro-futuristic names as Dial-A-Matic and Duplitron, used chemically treated paper that smelled horrible and eventually turned black. No one had devised a way to make a lasting copy on plain paper until Chester Carlson, a shy young New York City patent lawyer, came up with an idea during the Great Depression while looking for a solution to his writer's cramp. Carlson conceived a dry-printing process, called xerography, that would use photoconductivity, light and powdered resin to produce a mirror image of any document. He offered it to dozens of corporations, including Kodak and IBM, but he couldn't prove it would work. They all turned him down. Carlson spent more than a decade trying to design a working model of his copier -- an obsessive and mostly fruitless quest that cost him his first marriage -- until the Haloid company finally showed an interest. By the mid-1950s, Haloid had devoted a team of engineers to the project. It was a huge gamble. The team toiled seven days a week in a Rochester warehouse, but progress was slow. One early version of the machine stood almost 12 feet tall. Another could only make copies in the dark. Engineers improvised by cobbling together crude prototypes out of spare parts, such as aluminum pipes and rabbit-fur brushes. But the company was running out of money, and outside observers saw no market for the copier. "They all thought we were crazy. We were spending money we didn't have on a product nobody wanted," said Horace Becker, a mechanical engineer who worked on the machine. That pressure to succeed created a tense working environment, Becker, now 86, told CNN. "My favorite pastime was throwing up breakfast." By 1959, however, Becker and the other engineers had produced a reliable prototype. The model was called the 914, because it copied -- at a then-blazing rate of seven pages per minute -- original sheets up to nine inches wide and 14 inches long. The machine was an immediate hit with Haloid Xerox's secretarial pool. "Our girls love to use the 914 and have discovered many new copying jobs for it to do," Haloid Xerox President Joseph Wilson said in a 1959 news release that was very much of its time. "They feel great pride when their copies all look like originals." In fact, the 914's success may have been built on the enthusiasm it generated among those who actually used the copier most -- corporate America's support staff. These early adopters were overlooked by consultants who predicted the machine had "no future in the office-copying market." "They were asking the wrong people the wrong questions," said Ann Neal, who manages Xerox's historical archives. The earliest 914s cost $2,000 to manufacture -- too much to make them viable as mass-market products. So Haloid Xerox leased them for $95 a month, including 2,000 free copies. The company earned 5 cents for every copy beyond that, and because customers used the machines much more heavily than expected, the income added up fast. In 1959, Haloid Xerox's annual revenues were $32 million. By 1962, two years after the 914 hit the market, they had more than tripled. By 1968, Xerox (the "Haloid" name was dropped in 1961) was a billion-dollar corporation -- bigger than U.S. Steel. "It [the copier] made the company," Neal said. "It literally revolutionized the way business did business." By the time the first 914 model rolled off Haloid Xerox's assembly line, Carlson's original patent had expired. Even so, he became a wealthy man almost overnight. Fifty years later, many massive metal copiers are gathering dust in office storerooms -- long since replaced by sleek, digital desktops that print information from the Internet. Xerox doesn't even make a copier-only machine anymore, said Steve Hoover, the company's vice president of global software and solutions. "It's gone. They're all printers. Pure copying is down significantly," he added. Hoover said Xerox today must fight the perception that it's only a copier company -- an ironic position considering how the company made its name. "Sometimes you're a victim of your past success," he said. "The use of paper has radically changed. It used to be archival. Now, it's not," Hoover said. "The average document in the office, when it's printed, has a life of about two days." From resumes to party invitations, paper in the 21st century is rapidly giving way to digital content stored on computers and shared via the Web. So what's the future of copying in the age of the iPad? For starters, researchers at Xerox have invented a kind of silver ink that can conduct electricity and will allow them to add computing power to plastics, film and fabrics. "We're in a time of transition," Hoover said. "We're not worried about paper going away because we've got other technology we're working on. The next five years are going to be really interesting."